Since debuting their cloud-based coordination and communication platform for senior-care providers at a regional trade show in 2012, Asif Khan and Fahad Aziz have raised $2.5 million, won multiple awards and acquired more than 100 U.S. facilities as customers. But that doesn't mean they've outgrown the exhibition halls. To this day, they trumpet their web and mobile health solutions at trade conferences around the country, hitting an event devoted to assisted living every month or two--and paying up to $4,000 per show in registration fees alone. "That's where we get most of our leads," says Khan, founder and CEO of Caremerge, which is based in Chicago and San Francisco. "If you're a regular at these trade shows, you start to become a household name. You start to generate the buzz you want." Exhibitionist: Asif Khan of Caremerge. This isn't just about PR, though. For Khan, industry expos are the best possible venues for zeroing in on Caremerge's ideal prospects and partners. Rather than spend countless days and dollars flying around the country to meet with customers--current and potential--Khan relies on trade shows to bring the long-term care providers who are most motivated to solve their technology problems to him, all under one roof. "You get so much done in two days that you could not imagine getting done in six months or a year," he says. Of course, you can't just pull up to the nearest trade show with a laptop and samples in hand, expecting to wow the crowd. If you want to ace it as an exhibitor--and nab awards, press mentions, new accounts or distribution--some advance planning is in order. Consider this your checklist. Before coughing up those exhibitor fees, scout out the show as an attendee. (If possible, start with a local show to save on travel and lodging.) That's what Khan and Aziz did before launching Caremerge. Besides getting the lay of the land, they gained valuable intel about their industry and competition. "People love to talk at trade shows," Khan says. "By spending $300, you can answer a lot of questions." Once you register for a booth of your own, it's strategy time. Scour the exhibitor list and session lineup for potential customers, partners and advisors you'd like to meet at the event, then reach out to them. Follow the lead of Pacific Grove, Calif.-based Romy Taormina, CEO and co-founder of Psi Bands, an acupressure wristband for nausea relief sold in more than 10,000 stores. Once a conference releases the list of attendees, she sends an e-mail to companies with which she'd like to connect, including her booth number and a request to set up a day and time for a meeting. 2. Create an irresistible pitch. At his first hurricane-preparedness trade show in 2007, David Dodgen tried to demo his AquaPodKit, a bathtub bladder that stores 65 gallons of fresh water, using only a poster. It's not surprising that no one stopped at his booth. "I thought, This is not working," says Dodgen, who is based in Austin. So mid-show, he bought a bathtub at Home Depot, lugged it back to the venue, lined it with an AquaPodKit and filled it with water. "The media went crazy," Dodgen recalls. "There was a line of people at my booth." A great demo is nothing without a spirited, engaging pitch that presents the solution to a specific customer need--preferably in a minute or less. Dodgen has several taglines he uses at shows. Among them: "Stores 14 days of fresh water for all the basic needs of a family of four! "; "Much cheaper than stockpiling 65 gallons of bottled water! "; and "Much easier than getting to the store during an emergency!" A video demo also can work well, says Amy Wenslow, CEO of Products to Profits, a consultancy in Pasadena, Calif., that helps 'treps and small businesses develop, sell and market their wares. It's a great way to show off your product on your phone or tablet, if you need to do an impromptu demo outside the booth. However, Wenslow warns, a video should be kept under three minutes and, most important, "it's got to have conviction and energy." 3. Make your booth inviting. A big mistake newbies make is overpacking their booths with furniture and inventory. "You have to leave enough space for people to engage with you," says Wenslow, whose clients' products sell in Walmart, Target, Lowe's, Bed Bath & Beyond and Big 5 Sporting Goods. That means leaving room for your team, your demo and show attendees, many of whom will be toting large swag bags. To ensure you don't overcrowd the booth, map it out ahead of time in your office using tape on the floor, Wenslow advises. Another no-no: placing a rectangular table across the front of your booth. "That's basically saying, 'I don't care if you come in,'" Wenslow says. Instead, position large tables against the back or side of the booth. If you need a place to park your literature (and yourself), try a small, bar-height table and stools toward the front of the space. Taormina agrees that less is more. "A simple, clean booth that's bright and eye-catching is important," she says. "Sometimes people have been on their feet all day and just want to sit down." Be that welcoming beacon of calm amid the chaos where people can relax, and they may stick around to chat a bit longer. 4. Cut costs, not corners. It's essential to know where you should (and shouldn't) scrimp. 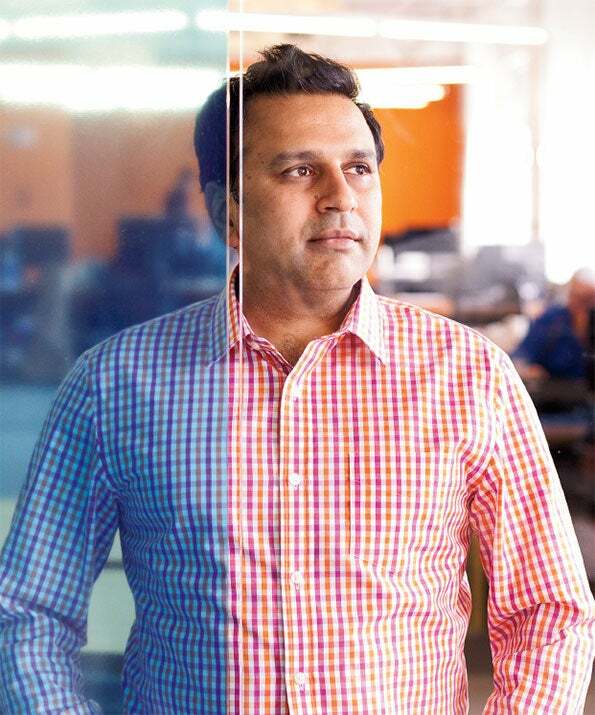 To minimize cash burn, Khan negotiated a 25 percent discount and a three-installment payment plan when registering for his first conference booth for Caremerge. He tapped university students for help with his logo, brochure and banner designs. Once his business gained traction and he was attending shows regularly, Khan made an online purchase of a fold-out booth display from a Chinese company for a fraction of what he would have paid to a U.S. manufacturer. Make sure you spend wisely when it comes to assembling your team for the show, too. "The people who go should be outgoing and able to ignite a conversation coming down the escalator," Khan says. He doesn't buy a full conference pass for each team member in attendance; if booth registration includes only one or two passes to the entire conference (sessions and expo hall), he leaves it at that. For extra hands on the trade-show floor, Wenslow recommends tapping temp marketplaces such as TaskRabbit and Fiverr to hire students willing to do odd jobs such as booth setup. 5. Know where to splurge. Taormina is a believer in buying as much visibility as one can afford. When she launched Psi Bands to the travel industry at the 2012 International Travel Goods Show, she paid about $250 more to display the bands in the new-products pavilion--and landed the show's coveted Buzz Award, selected by retailers and media. "For media and awards, you definitely want to be in the new-product showcase," Wenslow agrees. Same goes for businesses looking to woo big retail chains. Taormina is also a fan of renting a badge scanner when available--an expense she says runs about $250 to $300 per event. Rather than do the business-card dance with new contacts, you simply scan the person's badge, type any additional notes into the device and download all the digital data after the show. "It makes it a lot more efficient," she says. "The follow-up is so much more streamlined, and we don't have to rely on memory." Another worthwhile investment once you have a couple of exhibitions under your belt is purchasing booth furniture (as opposed to renting)--even if it means shipping it to out-of-state shows. Just be sure to buy furniture that's light and easy to pack, Taormina advises, noting, "Think about what can you invest in for the long haul that will save you money over time." Talk to everyone, everywhere--even in line for the restroom. "I've met two or three sales reps we use now in elevators at a show--just by being nice and saying hello," Wenslow says. Go out of your way to befriend show organizers and staff. Tell them what you're looking for, be it customers, investors or publicity. "If they know, for example, that we're looking to hit up certain media publications, they may drive those people to our booth," Taormina says. Get to know exhibitors in the neighboring booths, too. They can watch your turf when you need to sneak away for a minute or help keep an eye out for buyers you're hoping to meet. When exploring the show, don't roam aimlessly. "Go to the welcome reception," Wenslow says. "Think about which sessions the buyers and contacts you're looking for would attend." Check the show's website and Twitter feed for last-minute program changes and other highlights. Never leave your booth unattended, not even for a minute during lunch, and not late in the day when the event's winding down. That might be when the buyer you most want to meet visits your booth. In fact, Wenslow says, if you're in the new-products pavilion, that is precisely when buyers for the big-box stores will stop by. 7. Follow up and evaluate. Your post-show checklist should include more than merely reaching out to new contacts. Look for other opportunities to communicate with your industry. For example, Taormina likes to include any breaking news--an award, a hot new customer--in Psi Bands' newsletter. She'll also send a press release announcing big wins to relevant trade publications, a move that has garnered her multiple write-ups. Follow-up isn't just about closing sales. It's also about gauging an event's return on investment. It's wise to attend a show with preset goals in mind (think: media hits, investor interest or retail leads). "With trade shows, you can see, How many leads have I gotten? How many customers have I closed from those leads?" Khan points out. "This is pure, back-of-the-envelope ROI that you can track."